It is April 15, 2015 and today is the 150th anniversary of Abraham Lincoln's passing. The previous day he was shot by John Wilkes Booth in Ford's Theater. I have a relevant artifact for this particular sesquicentennial moment. It is this very curious CDV image. 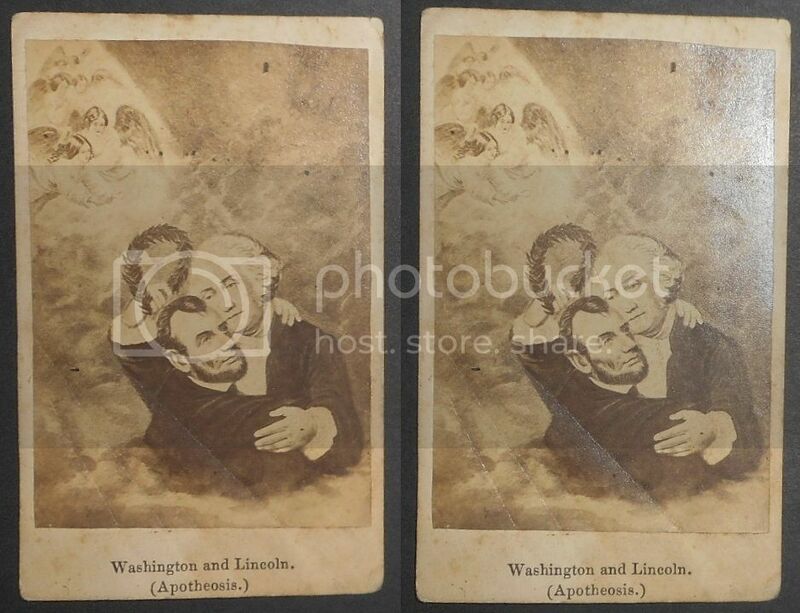 It is titled Washington And Lincoln Apotheosis. Apotheosis is the state of elevation or deification. In the image you see the recently-deceased Lincoln being embraced by George Washington and you see the angels in the top left corner. This was painted in 1865 and this CDV image is from the 1860s or, perhaps, 1870s. A very curious and very bizarre item on this day ... the 150th anniversary of Abraham Lincoln's death.